Range Systems has been an industry-leading provider of shooting range systems and equipment for over two decades. Helping your business convert, and grow! The Range Systems build was definitely an interesting one for our team. 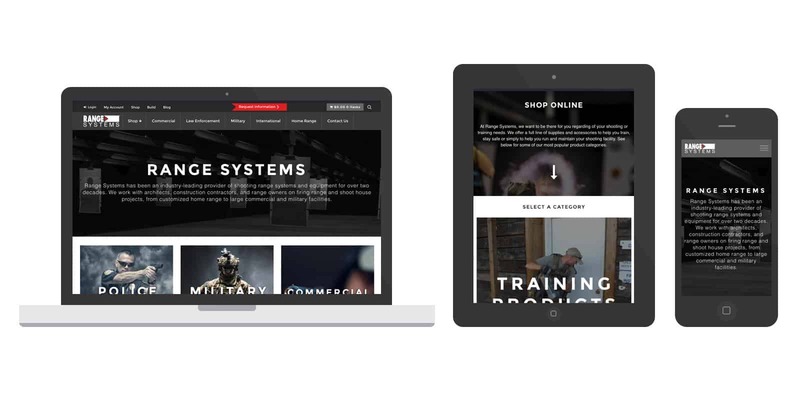 We did our initial build of the site using designs specified and created by the Range Systems team. During the process, we made several suggestions, but ultimately designed the site that they requested, without most of our suggestions, with an emphasis on their WooCommerce store. Which we were more than happy to do, we want to make sure our client’s love the sites we build. However, after a few months, the site was not converting the way they had hoped, and they were frustrated with the usability. Their customers had complained about the way the site was structured, and their sales had remained flat. So they called Spark Logix Studios for help! We did a complete overhaul of the design of their site. Luckily, since we had built the site structure properly the first time, it was merely a complete front end redesign, nothing that altered the functionality of the site. With a new focus on what would make their clients convert, and implementing the suggestions we had made during the first design to createg clear channels into the content and products they offer for their various markets, and with the new modern design, they began to see a significant jump in sales through the website, as well as new leads generated through the site’s content.